Karan Kandel received a BFA from Tyler School of Fine Arts in Philadelphia with a concentration in painting. She has studied with such artists as David Pease at Tyler School of Fine Arts in Rome, Roberta Marovelli at the Corcoran School of Art in Washington, DC, Sam Perry and Jim Petrecig at the Armory Art Center in West Palm Beach, FL, and Susan Ogilvie, Gabor Svagrik, and James Coulter at the Scottsdale Artists School in Arizona. Karan has been involved in creative and fine arts in some form her entire adult life. She has: Designed and produced clothing and accessories in India and Hong Kong (where her work was regularly featured in newspapers and magazines), owned a design/fine furniture showroom in Washington, written about commerce and the arts in Georgetown, and painted throughout. It is her love of nature and her desire to record it, color it, live it and touch it that drives her to paint. 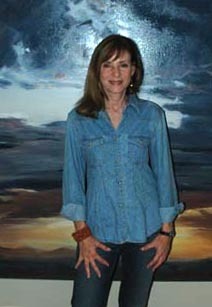 Her work has been widely exhibited, has won awards in juried shows in the U.S., and is held in private collections in Palm Beach, Washington, DC, and Boston. Karan lives in Washington, DC and Scottsdale, Arizona.